My significant other and I just had a redo of our vacation in Provincetown that did not end up happening in July. So, in honor of that, I’m presenting Helen Frankenthaler (1928–2011), a true American art legend who lived in P-town when she was married to Abstract Expressionist Robert Motherwell (1915–1991). I’ve seen the house they shared there and apparently they had to install a garage door in the back of the house (beachside) in order to accommodate their huge canvases. We all know Frankenthaler as the pioneer of stained-canvas Color Field painting. I have found myself recently even more in love with her work when I understand how she tried—and succeeded—to translating the Color Field aesthetic to printmaking. Raised in New York, Frankenthaler became a pupil of pioneer abstractionist Hans Hofmann (1880–1966), whose school in Provincetown I featured prior to my earlier attempt at a P-town vacation. Her earliest works were influenced by the Cubism of Picasso. She moved into freer forms inspired by the organic abstractions of Kandinsky, Miró, and Arp. The pivotal period of formation of her style started around 1951, when she spent summers in a Cape Cod studio. She painted numerous studies of hills and woods in watercolor washes. From these washes, Frankenthaler produced paintings in thinned oil on raw canvas. Also during that time, she was introduced to Jackson Pollock (1912–1956), and seeing his paintings and his methods excited her tremendously. She felt that his method of painting on the floor would be a good jumping-off point for her to realize freer form. Her first exhibited painting in the stained style, Mountains and Seas, exhibited in 1952, had a major and lasting impact on abstract painting. Frankenthaler was the first artist to explore the possibilities of staining raw canvas. In such a technique, whether in oil or acrylic, the ground and color are integrated and the distinction between foreground and background ceases to exist. As in action painting, the emphasis on pure abstraction is meant to focus attention on the act of painting itself. 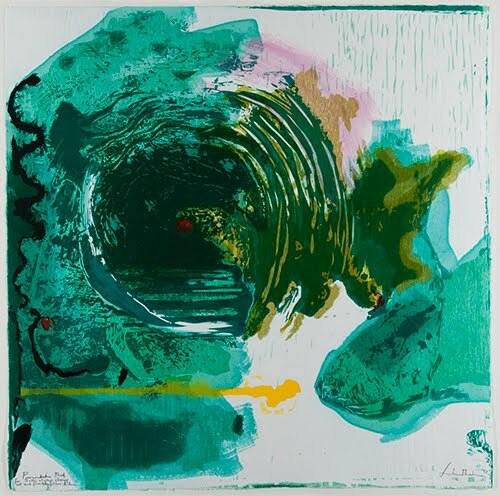 Frankenthaler extended her interest in merging support and color to her printmaking. Unfortunately, because Abstract Expressionism was dominated by an emphasis on painting, printmaking was considered by the Art World “elite” to be a marginal art form. After Russian émigré Tatyana Grosman (1904-1982) founded Universal Limited Art Editions on Long Island (1957), the European esteem for printmaking was introduced to the New York School and many of the artists reluctantly tried their hand at it (lithography at first). Frankenthaler, too, reluctantly approached printmaking—beginning with lithography—after seeing the works of Grace Hartigan (1922–2008) and Larry Rivers (1923–2002) in 1961. Around 1974, she began to work in woodcuts. As she had with lithography, she was trying to achieve the same visual effects in woodcut as in her painting. With the initial cutting of the blocks, mixing of colors, approval of registration marks, and selection of paper, she wanted to be totally involved. The mass reproduction of the approved blocks she assumed would be left to printers who were artists in their own right. Some of Frankenthaler’s multiple block woodcut prints dwarf the Japanese ukiyo-e style, wherein twelve blocks were used. She produced works using up to 102 colors and forty-six blocks of wood! In works such as Radius, which references landscape, Frankenthaler hoped to achieve a result wherein the images seemed to be laid down all at the same time, like her paintings. This was her guiding aim with her woodcuts. Starting in the 1990s, she began to experiment with dyed pulp paper in order to further the effect of layers of color like her color field paintings.